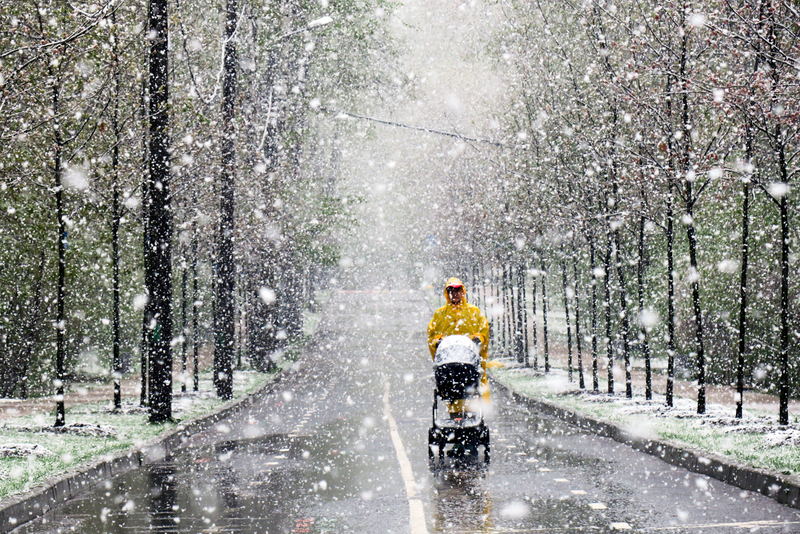 MOSCOW, RUSSIA - MAY 8, 2017: A person with a baby stroller in Moscow's Sokolniki Park during a heavy snowfall. It’s because a January day off was put back, say users. The weather in Russia is a capricious lady. In the midst of the May holidays (May 6-9 in honor of Victory Day), many Russian cities experienced heavy snowfall—so instead of traditional shashlik (kebabs), social media were full of snowmen and snowy landscapes. Some joked that it was because FC Spartak had just won the Russian soccer league for the first time since 2001—a huge surprise for everyone, including the gods in the sky. Others wrote that the Russian winter, a trusty ally of the Soviet army, had decided to take part in the Victory Parade. Still others congratulated each other on the forthcoming New Year. The abundant snowfall in and around Moscow on the afternoon of May 8 was repeated two days later. According to forecasters, Moscow is approaching the record set in 1922, when more than 35 mm of precipitation fell in just a single day. Victory Day in Moscow was the chilliest since 1945. Meteorologists note that over the past 130 years the daytime temperature on May 9 had never previously dipped below +5°C. But this year saw temperatures in Moscow ranging from +3.6 to +4.6. The snow must go on: May snow in the finest traditions of British rock group Queen. May 8, 2017, was a day off carried over from the New Year holidays—together with the weather. Snow-covered St. Petersburg on May 8. “Three cheers for winter!” Wearing a ski-jacket in May makes a change, but what about the flowers? May blizzard in the Khabarovsk Territory (Far East). Spring is in the air? Someone forgot to tell the snow.